Bring the cafe into your kitchen and pour this invigorating cafe-au-lait into your coffee mug this morning! Microwave milk, coffee and hazelnut spread in a large, heat-proof glass bowl on high for 2 minutes or until mixture is hot, not boiling. Whip with a hand mixer or whisk until frothy; pour into 3 serving cups. Top with whipped cream and dust with cinnamon. 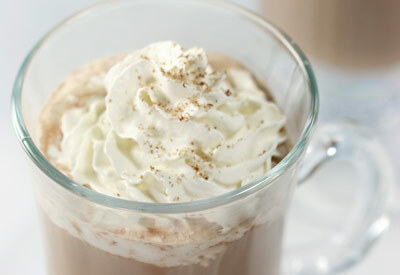 To save time, use a can of pressurized whipped cream to top the drink.